Chartres lies on the banks of the river Eure. In Latin it is Carnutum or Carnotum ad Auduram. The Cathedral Church of Notre-Dame is very beautiful, and the crypt is richly ornamented, decorated and illuminated by several silver lamps. The outside surroundings of this church—I mean the Cathedral—are quite beautiful. There are three very large porticos. Atop that of the main door there are two towers visible from 5 leagues away. The choir is one of the biggest and most beautiful one can find, and filled with a very great number of chairs, two rows of stalls on each side, and a rather large bench as a third stall, with a step of carved wood. The bishop’s chair is rather ordinary, and placed on the Epistle side at the head of the canons’ seats, as in Paris and Rouen, but it is not covered. It only has a carpet in front and a seat for the bishop, as in the illustration. The main altar is quite big. It has no balustrades, but only brass columns with angels on top arranged around the sanctuary. The antependium (parement) is attached to the altar-cloths a half-foot over the edge of the altar. Its fringe rests on the altar table itself. Above the altar there is only one veil (parement) on the retable, above which there is an image of the Blessed Virgin in gilded silver. Behind the veil is a bronze bar, and above it a gold crucifix one and a half foot tall. At its foot is another bronze bar that protrudes about one or one and a half feet over the altar. On the end of it hangs the holy Ciborium, according to the Council of Tours, sub titulo crucis Corpus Domini componatur. Above the corner of the altar there is a small violet veil about one square foot in size, suspended from a small cord as at Orleans. Just before the Consecration, the deacon draws it to the center of the altar so that (they say) the Sacred Host can be seen by those standing in the back of the choir. This small veil is a very ancient custom in this church, as they say. I believe the real reason was to present the priest during the Consecration with a vivid image of Christ on the Cross. There is such an image on the veil itself, which was called the majestas or divina majestas. Inclinet ante majestatem. There are aisles that allow one to walk around the choir, but the stained glass though very large is so dark because of the painting and thickness of the glass that in wintertime they still use bougies at 10:30 in the morning after the conventual Mass to say Sext. At Sext they do not respond Deo gratias after the Short Chapter. There is no response to the Versicle after the Brief Response, which has a melisma as long as the Verses of the major hours. Apparently they make the response in a low voice during the melisma. The blessing of the holy water on Sunday is not done after Terce, as in most churches, but at the first Mass, which is said at four or five in the morning. The priest who will celebrate it is vested in an alb and stole and blesses it in a stoup, sometimes at the entrance of the church, sometimes in another place, and then he goes to the chapel to sprinkle the people present to hear Mass. Before High Mass, an altar boy brings the holy water bucket (or Orceau, as it is called in Chartres, from the Latin term urceus or urceolus) when everyone is ready to hold the stations. The procession goes out from the choir through the crucifix door, and without going through the nave it goes directly to the altar of St John the Baptist at the intersection on the left. The priest, accompanied by the deacon and subdeacon vested in albs and stoles, except the subdeacon, with an almuce over their arm and their biretta in hand, sprinkles the altar, then the deacon and subdeacon, and then the entire clergy. After the procession has made a turn around the entire choir, it enters again by the same door. The same practice is found in many large churches that I describe in this account; this makes it clear that the purpose of the Sunday procession before Mass was to sprinkle the people and the common places. At Solemn Mass, the priest, deacon, and subdeacon first reverence the altar and then turn towards the choir and reverence it. Then they turn back towards the altar and begin the Mass, before going up to the altar. During the Gloria in excelsis the subdeacon goes to the jubé [i.e. rood-screen tribune] with the Epistle Book, and at the same time the deacon, having received the Gospel Book, retires behind the altar. The priest remains alone at the altar with his assistant priest clad in a surplice, standing at the end of the altar to serve the celebrant. After having sung the Epistle, the subdeacon returns to the altar. The deacon immediately comes out with the Gospel Book and, having received the celebrant’s blessing, goes to the jubé accompanied by the subdeacon, who holds the cushion; the altar boy who walks in front incensing; and the two candle-bearers. From the moment the deacon goes away from the altar, he raises the Gospel Book with both hands and, as he passes, the clerics get up and bare their heads. The subdeacon takes the open Gospel Book to the celebrant for him to kiss, and then to the canons at their places, and then he returns to the altar. When the priest has incensed the altar at the Offertory, the deacon takes the thurible that the altar boy gives him and goes down the altar-steps and, having incensed the altar with three strokes, he kisses it at the corner. Then he continues to incense it by going around it, and he incenses the two reliquaries with three strokes each, and goes back to his place. A short moment thereafter the altar boy takes the thurible to the deacon, who incenses the rest of the altar in the same way, kisses the other corner, and then incenses the priest and subdeacon. Then the thurifer, having received the thurible from the hands of the deacon, incenses him. The deacon always holds his biretta in his hand and during the entire Mass he does not put it down except when taking the Gospel Book to the jubé. At the Sursum corda, the subdeacon receives the paten, which is given to him with a veil. He holds it slightly elevated in front of him behind the altar, so that he sees nothing that is performed there. One remains standing at the elevation, except only at Masses when one says the O salutaris Hostia, and then only while it is being said. At the Pater, the subdeacon comes back in front of the altar and gives the paten without the veil to the deacon, who holds it even higher than the subdeacon until the end of the Pater, when he puts it back on the altar. Then the choir sings the psalm Exaudiat, during which the celebrant, his ministers, and all the clergy kneel. Then the priest receives communion, and the deacon, taking the cruets, pours out the ablutions. This is the only time that the deacon serves the priest. An altar boys gives him a basin to wash in as at the Lavabo, and pours the water out into the piscina, so that the priest is not obliged to drink what he rinses off his fingers. This was done everywhere in former times, and is still done at Lyon and among the Carthusians, who have preserved more ancient customs. The priest goes to the corner of the altar to say the final prayers, and the deacon, having turned towards the clergy, sings the Ite missa est. Then the Celebrant gives the blessing and goes back to the sacristy with his minister in the same order that they came in. When the bishop celebrates pontifically on great feasts, he gives the solemn blessing at the Agnus Dei, and not at the end of the Mass. The ceremonies of public penance on Ash Wednesday and Maundy Thursday are more or less the same as those we shall describe for the church of Rouen. On Maundy Thursday, six priest-archdeacons celebrate the High Mass together with the bishop, consecrate the holy oils with him, and receive communion under two species from the same host and the same chalice. The bishop stands before the middle of the altar, with three priests at his right and three at his left, along a single line. All seven sing with one voice and carry out all the ceremonies of the Mass together. Praiseworthy church, which has carefully preserved such an august and ancient ceremony! which helps us understand why in several churches the bishop is assisted on great feasts by priests and curés in the celebration of Mass. At the end of the Mass, the deacon, without saying anything, gives the blessing with the sacred Host before taking it to the Treasury where it is reserved in a burse for the following day. On the same day, the Mandatum or washing of the feet was performed. The altars, however, are not washed until the following day right before the start of the Mass ex praesanctificatis. During Easter week, the Procession to the Fonts is performed at Vespers. All the clergymen of the Cathedral Church who are neither priests nor deacons, whether or not they be canons, carry a white baton during this procession, as does the sub-cantor who walks at the head of the younger canons. This is done, it is said, to represent the white habits that the newly-baptized used to wear during the Octave. On the way to the fonts and coming back they sing the fourth and fifth psalms of the feria. Although this Church fasts on the vigils of Apostles, and observes more fasts than others, it nevertheless does not keep the fast on the Vigil of Pentecost, following the ancient custom of the Church, and of the churches of Angers, Nantes, and Amiens. Indeed, the Father attest that there was no fasting during the fifty days of Eastertide, which only ended on the evening of Pentecost Sunday. On the Ember Wednesday of December, they read the entirety of the Gospel Missus est as the first lesson of Matins, like at Sens. Then the choir prostrates itself and sings the antiphon Salve Regina, and then the homily is read as usual. On this difficult passage, consult Claude de Vert, Explication (…) des céremonies de l’eglise, pp. 297 and 355, where he explains the typical way the antependium was suspended from the altar by an iron bar, which was in turn covered by a sort of fringe. De Vert and other, especially Jansenist contemporaries disparage the antependium as one of the unnecessary ornaments of the altar. At this time in many places, the pre-mass procession continued but without the sprinkling of people, church, and common rooms of the cloister. In several places, De Moléon stresses the origin of the procession as a sprinkling rite. The French word for rood screen. See an extensive article on the French rood screen (here), and its disappearance (here). On rites attending the Pater noster, see Jungmann vol 2, pp. 299 et sqq. In many places the Pater noster including an elevation or ostentation of the host, or the raising of the paten during the prayer at panem nostrum, as a signum instantis communionis, a sign of the imminence of Communion. On the addition of post-Pater Noster prayers in the Middle Ages, which were allowed to drop during the 16th century reforms, but flourished in many places afterwards, see Jungmann, Missarum Sollemnia, vol. 2, 292-293. In some places a prostratio was expected at this point. “The Gallic pontifical blessing, like the blessing in the Orient, was usually preceded by the deacon’s exhortation: Humiliate vos ad benedictionem, which was answered by a Deo gratias; then the bishop, with mitre and staff, turned to the people and read the formula of blessing from the Benedictionale held before him; at the concluding sentence he made the sign of the Cross three times in three directions. The formula of blessing itself was regularly composed of three members, following the model of the great priestly blessing in the Old Testament (Numbers 6:22-26), which also appeared in the most ancient collections. After each of these three members (usually consisting of well-rounded periods) there was a response, Amen, and at the end a special concluding clause” (296). 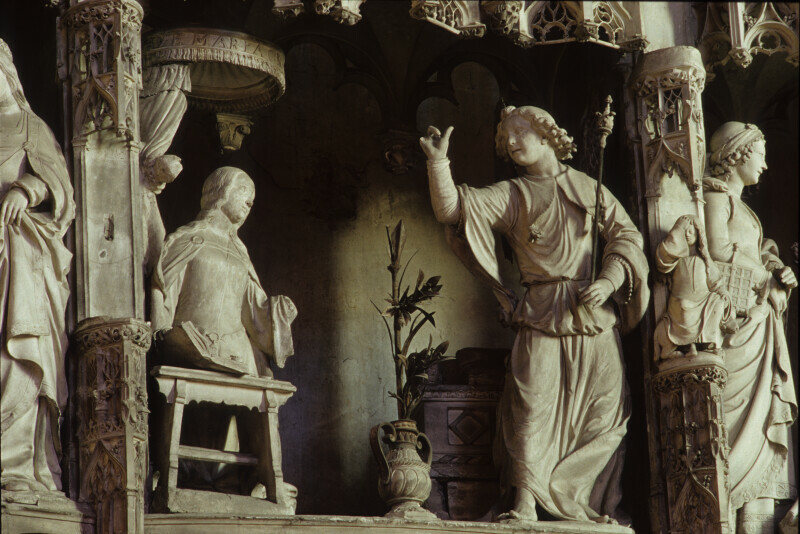 Jungmann notes that this blessing was retained in the cathedrals of Lyons and Autun right up to his time. On the origin and development of concelebration in the West, see Jungmann, Missarum Sollemnia, vol. 1, pp. 195 et sqq.